This month we will focus on the stylish Calla. You can read all about this flower that combines style, simplicity and cheerfulness. Surprise your customers over this month with the Calla’s fantastic looks and styling possibilities? The Calla offers plenty of choice when it comes to colour. The flower comes in white, red, yellow, pink, purple, orange, green, black and bi-coloured. The most noticeable aspect of the Calla is the beautifully shaped spathe. This spathe is actually a petal, and emerges serenely and majestically from the stem. It’s a kind of wrap that slowly opens up until you can look deep into the heart of the plant. The actual flowers are very small and are located on the elongated spadix in the centre of the spathe. 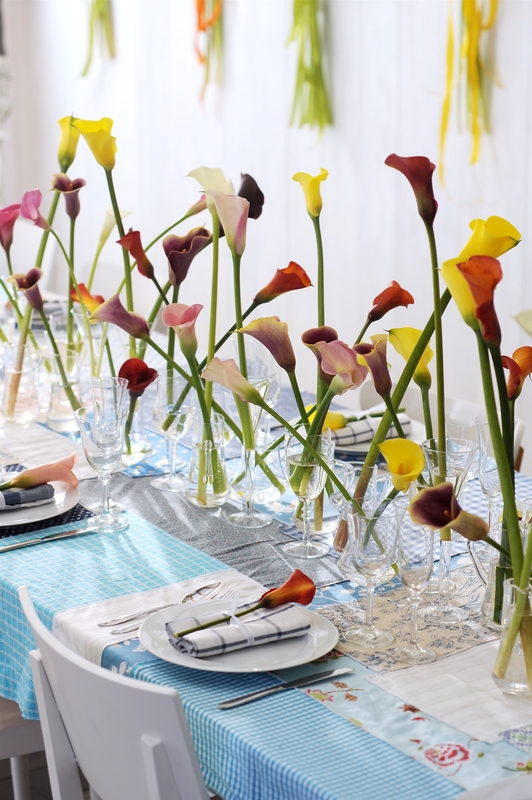 The Calla can be styled in various ways, but we’ve opted for an elegant expolion of warm tones and vibrant Callas. Consumers can also find special DIY craft projects involving the elegant Calla at Funnyhowflowersdothat.co.uk.